Still in the "soft opening" stages to work out the very few kitchen kinks, Blu Margarita is on the right track in so many ways. Located in the former "Ganache" space on Elm Street in downtown Greensboro, Blu Margarita is gorgeous, with aquatic colors saturating the walls. TVs mount the wall beside the swanky bar, so oddly reminiscent of an aquarium that I had to do a double take. Impressive Mexican cuisine and a killer bakery selection, Blu Margarita has my name written all over it. A revisit to the inconsistent pricing and clarifying the hostess - server - bakery counter roles would be an improvement. Crisp, thin, salty tortilla chips are served with technically perfect salsa, containing just the right amount of heat and cilantro. Seconds of both were brought, as if the server could read our minds. The Perfect Margarita is essentially that, combining Tequila, Cointreau, Fresh Lime Juice and Simple Syrup. The words Cointreau and Margarita are a match made in heaven. (Seriously. My uncle introduced me to the addition of the Orange Liqueur to the tartness of a Margarita and it has rocked my world.) The Epic Sunset is a whirlwind of Stoli Orange, Grand Marnier and Campari with Orange and Passion Fruit juices. This is for bitter drink fans. I'm looking at you, Negroni-lovers of the world, ie. my sweetie. I will be back for the Spicy Samba - Tanteo Jalapeno Tequila, Lime Juice, Jalapeno Infused Agave Nectar, Cilantro and Cucumber Slices. Olé! The taco selection is awesome, and upon first glance, super affordable. Tacos are ordered a la carte, and the most expensive one is $3.45. They don't skimp on the fillings, if that's what you're thinking. Taco de Camarones features plump, Grilled Shrimp with a Roasted Bell Pepper Aioli. The Shrimp is cooked perfectly, and was falling out of the Corn Tortilla. Taco de Pescado is described as Marinated Fresh Fish, with a Spiced Yogurt Sauce. I very much enjoyed this, though I would have like to know that the fish is fried, not grilled. For some reason, I associate the word "fresh" with "grilled." My bad. Still tasty. The Taco Al Pastor rocks Pork and Pineapple, in a savory sauce. All tacos are supposed to be served with Avocado, Radish, Lime and Grilled Jalapeno, but upon my second visit, I was shorted on the Radish and Jalapenos. A colleague's huge lunch of 1 Taco (+protein), 1 Enchilada (+protein), Spanish Rice, Refried Beans and Pico de Gallo Salad was $5.95. My two tacos were $6.25, and smaller than the taco my colleague was served. I would have paid $3 extra had I opted to get the rice and beans combo. A suggestion to diners - look for the better deal. A suggestion to management - revisit the pricing structure on certain items. I would be remiss if I did not go on and on (and on) about the bakery display. It's as if Ganache has been reincarnated, under a different pastry chef. Just about any cake imaginable is available, and they all look just delectable. Italian Cream Cake is moist, with thick layers of frosting, with Coconut and Pecans piled on. It's a winner. I was let down by the Raspberry Cheesecake, but I was intrigued by the Almond crust. (I just had Cheesecakes by Alex the night before so it's almost impossible to compare). 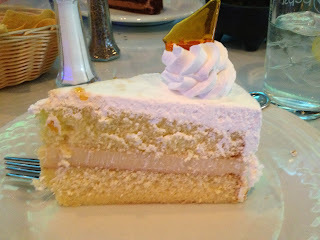 I was hoping that the Tres Leches Cake would be drippingly moist, but it was moist-ish. It features a layer of flan in the middle, with a light whipped topping. My favorite part of this was the Butterscotch Candy glass shard that perched out of the cake. With the addition of an outdoor bar upstairs, I know where I'll be come summertime. I just hope they survive the winter. Blu Marg could gain a cult following. They've done a tremendous job with the place, and my reviews are (mostly) soaring.